Oliver’s First Solid, a photo by carolinearmijo on Flickr. 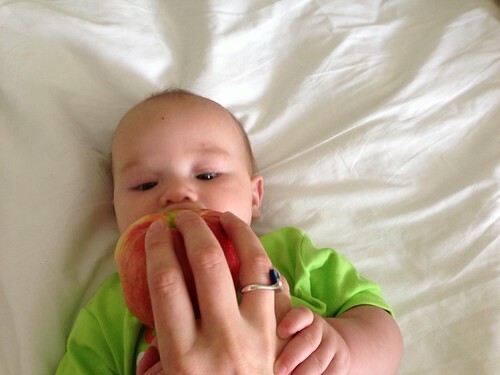 Oliver tasted his first food today – my very favorite – a honeycrisp apple. Anyone who hates apples has not tried this variety. Maybe that’s the one Eve tasted? I bought a half peck at the farmer’s market. Just as I suspected, he was pretty into it. I also let Lucy taste an apple for her first food. I hate to say I don’t know how many weeks old Ollie is. I think I knew Lucy’s age by weeks almost up to a year. Hmmm… I’m guessing he is very close in age to Lucy in this video. Do they remind you of each other?